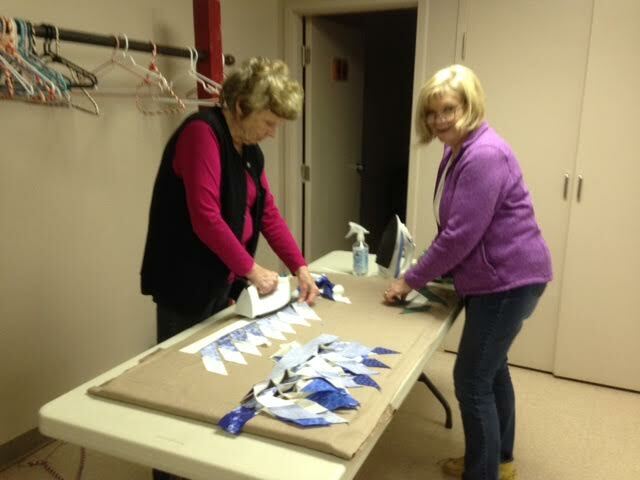 A great time for quilting! Hey! I have snow on my beard! Hello Friends. We have had a very gentle winter here in Northern Ontario this year. Snow accumulations have been minimal and the temperatures quite lovely. The down side of all this is the ice has been “iffy” so the usual winter walking trail has been off limits. Hubby did venture out on the weekend to cut the downed trees and pack the trail for walking but temperatures have gone above 0C so we will have to wait for some colder nights before we can venture out without sinking and breaking through the snow. The registrations for the workshops with Anita Zobens are coming along quite well, but there are still a few spaces to fill. If you have been contemplating or procrastinating signing up I urge you to call or email. A full house would be nice considering that she has come all the way here and would be a shame not to take advantage of this opportunity. I have finished getting all the kits ready for the workshops, which means all you need to bring is your sewing machine and a few notions. It is going to be such a fun and informative weekend. Click here for more information on the Quilting Symposium with Anita Zobens. Anita will be setting up her booth with all the threads and goodies for sale both Saturday March 12th and Sunday March 13th, after class. This will be open to everyone, so pass this info along and come on down to the Holiday Inn in Sudbury for some threads and things shopping. I will also have my table set up with my favourite things and more for sale just to make this a perfect weekend for some shopping therapy. Hurry, Hurry read all about it, my April workshop is open for registration. Our learning adventure this spring will be playing with the Rapid Fire Lemoyne Ruler. I have chosen this block pattern called “Flying Swallows”. Strip pieced, no inset seams and Oh So Cool! I can't wait to share it with you. We will be covering the two main construction methods outlined in the Studio 180 Lemoyne repetoir. Mark your calendars as the date is Friday, April 1st to Sunday April 3rd 2016. Click here to read more about it. 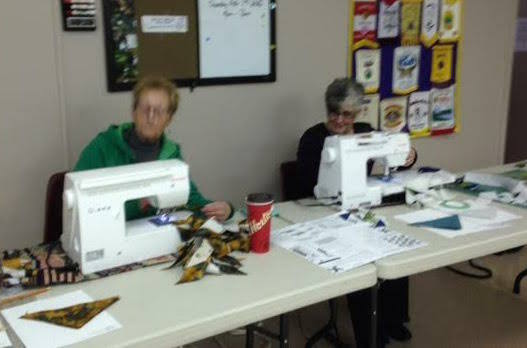 Speaking of workshops, Martha from Sault Ste. Marie, sent a picture along of her finished (but not yet quilted) Northern Neighbours quilt that she did at the workshop back in April of 2015. It is stunning. I so love seeing pictures of the finished projects. Way to go Martha! Martha's Northern Neighbours. It is so lovely and they are all so different. I couldn't resist posting the picture just to make you drool! February is Holiday Month, Jim and I will be basking in the sun (not basting lol ) on a beach in the south. Yahoo!! I will be gone from February 8th to the 24th , available by email only. Flying Swallows workshop information packages will be mailed out when I return home at the end of February. I am working on a multicoloured sample for the Flying Swallows workshop and will post a picture as soon as it is complete. (hopefully before I leave on vacation) This variation is for those who want both a construction and colour challenge. 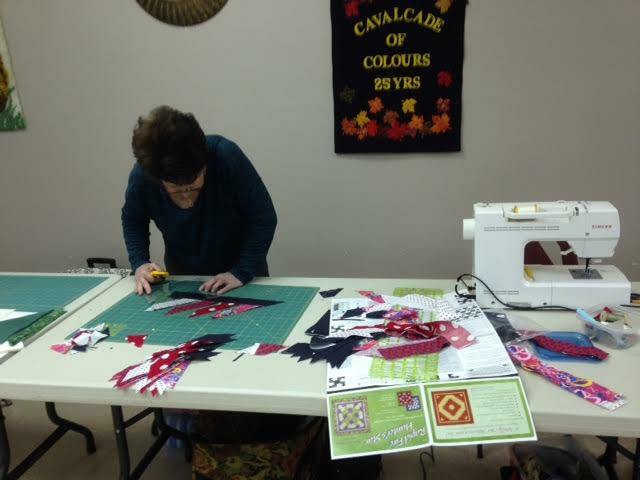 This Saturday I will be creating Hunter's Star quilts with the gang in Dowling and Onaping Falls. It most certainly has become one of my favourite quilts and seems to be the technique that keeps on giving! I will be posting pics from the workshop so check me out on facebook and instagram. Click on the icons at the bottom of the page. Hello to all in Timmins! Looks like I will be spending some fabulous quilting time with the talented quilters to the north. I am booked to be there the weekend of April 23, 24 2016. Project to be announced. Check back often as with spring arriving things start to pick up here at the studio. Don’t forget to check the Upcoming events part of my website so you don’t miss out on exciting workshops. Thanks for dropping by, until next time, stay safe, watch out for ice, and Happy Quilting. Hello Friends. A big Thank you to my guy for all the work he does setting up for workshops. Setting up for a workshop is lots of hauling and heavy lifting, taping and electrical stuff. All of which I could not do by myself. Also, the trip to town to set up has become a bit of a date, (just a peek into our crazy busy lives, but hey, I'll take it!) as we get to spend time together, and go for supper afterwards. The Hunter's Star Workshop fell on Halloween this time. Oh what a blast! Dressing up was not mandatory, but I knew the quilter's would take this opportunity to get a little crazy! Then there are those who just kick it up a notch and get right into the spirit of things! Now lets not forget the learning aspect. The quilters found their inner designer, and by the end of the workshop, the Hunter's Star creations were beginning to take shape. I love to see the finished creations, so remember when you get your design done email me a picture so I can share it with everyone. All in all we had a blast and I can't wait for the next one! Thank you everyone for spending some special quilting time with me. Can't wait to do it again. Well, speaking of the next workshop! 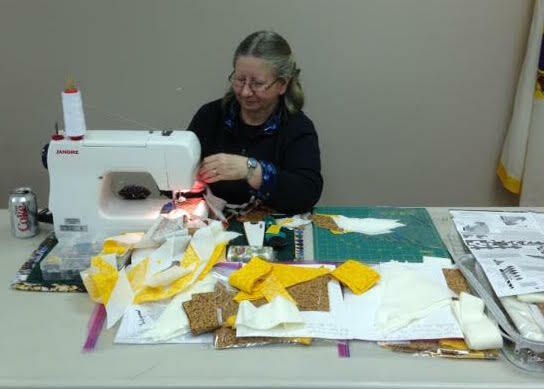 I'm busy getting things ready for the Quilting Symposium in March, featuring Anita Zobens. I like to be prepared, you know, time has a way of creeping up on us. If you haven't heard the buzz click here for more information. That's all for now friends. Thanks for dropping by. I think I'd better go tidy my studio! Until next time, stay safe, enjoy our beautiful weather, and go make your own mess!